With several thousands of machines installed, Stratasys is one of the world leaders in 3D printing, a fast-growing technology for producing prototypes by additive manufacturing. Stratasys is headquartered in Israel, with offices in the United States, Europe, Asia, Australia, Japan and Mexico. The company also draws strength from a global distribution network. The Stratasys 3D printer range (Eden and Connex, and desktop printers Objet24 and Objet30 Pro) cover a broad spectrum of requirements in terms of precision, effective volume and range of materials (107 available combinations). Stratasys’s printers produce accurate, fine and detailed parts. These assets mean that Stratasys printers are in demand for design validation applications and functional testing, as well as jobbing and small production batches. Stratasys printers are used in a wide variety of sectors, from the manufacturing industry through to medicine, fashion, architecture, archaeology and education. Since 2010, Stratasys has been using the e-marketing services of TraceParts, the brains behind the 3D component library (TraceParts.com) used by designers and engineers around the world. Stratasys had several requirements – spread the word about its product range, company and distribution network, and raise awareness of the new materials. The company was looking to generate sales opportunities, while increasing brand awareness and boosting traffic to its websites. 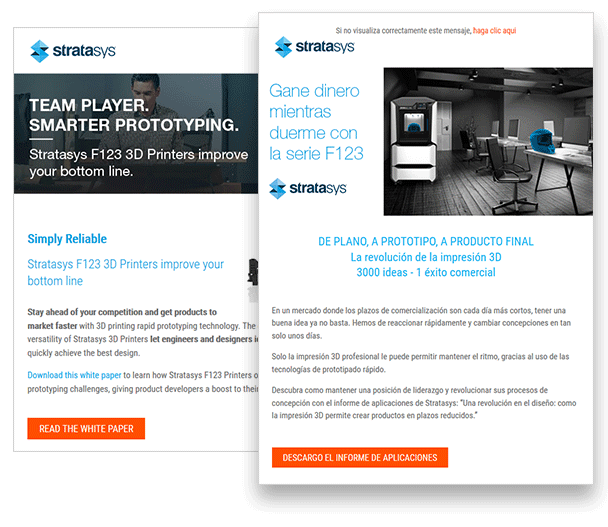 Stratasys regularly uses email campaigns targeting TraceParts users in France, Germany, England, Spain and the United States. Like Stratasys, a number of companies in the mechanical industry and CADAM sector have placed their trust in TraceParts to promote their products and services through email marketing and banner campaigns.